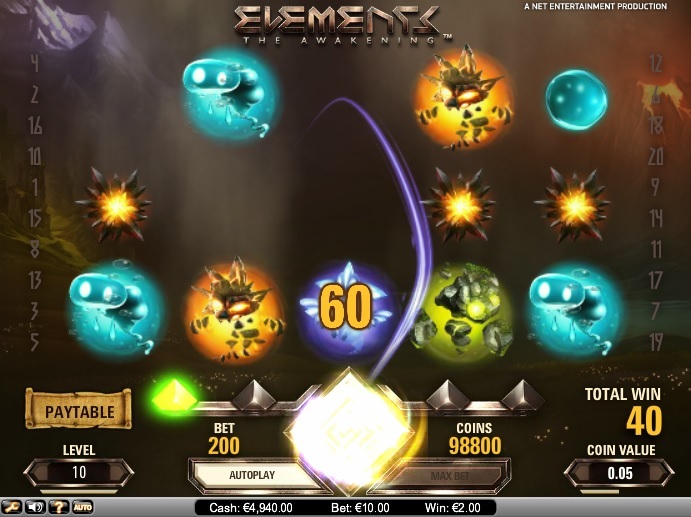 Net Entertainment’s Elements slot is based on a unique theme and packed with four different types of free spins rounds, each associated with fabulous bonuses. Elements is an online video slot with 20 fixed paylines. Players can bet up to 10 coins per payline, choosing from coin values that range from $0.01 to $0.50. If players want to bet the maximum of $100.00, they have to hit the Bet Max option. If players do not want to spin the reels manually, they can use the Autoplay feature. After placing their bets, players can hit the Spin option to set the reels spinning. If a winning combination is displayed on the reels at the end of one spin, players will be paid according to the game’s pay table. Players can place another bet and try again if they do not win any prizes. The presence of a Skill Stop feature makes Elements a skill-based game as players can capture winning combinations and grab payouts by stopping the reels in mid spin. NetEnt developed Elements in honor of the four elements—Fire, Water, Air, and Earth. It is a beautiful slot with splendid graphics and color scheme. The reels are packed with various symbols associated with the four elements. Elements has a wild symbol in the form of the Elements wild, which appears only on the second, third, fourth, and fifth reels. The wild symbol can help players complete winning combinations by substituting for all other symbols across the reels, both in the base game as well as in the bonus features. Elements comes with the innovative Avalanche Feature, which helps players win plenty of coins. This feature gets activated as soon as players spin a winning combination along a line. The symbols in the winning combination will explode and vanish from the reels. Fresh symbols will fall from above to occupy the spaces created, leading to more winning combinations, avalanches, and payouts. The slot features an Avalanche Meter, which faithfully records the number of avalanches players will get, and an Energy Meter, which indicates the most dominating element. When players activate the Free Falls Bonus Round, they will receive the free falls associated with the dominating element. If players get four avalanches, one of the four Free Falls features get activated. These are the Fire Storm Free Falls, the Earth Storm Free Falls, the Air Storm Free Falls, and the Water Storm Free Falls. Each of these free falls modes comprises 10 free spins with an extra wild symbol. Elements is a charming slot that gives players opportunities galore to win up to 300,000 coins, which is much more than the top fixed jackpot of 1,500 coins. The slot is available for fun or real money at any NetEnt online casino.